convert-im6.q16: not authorized `scan.pdf' @ error/constitute.c/WriteImage/1037. ImageMagick has supported a security policy for some time. The ImageMagick project itself, and the Linux distributions in which it's included, have made the policy a little more strict. Now it refuses to write PDF and PostScript files on my system. The error message is true, but it isn't helpful. I don't care precisely where within the code that it was denied, I just want to know how to turn this on! However, that might be dangerous. There are severe risks associated with PostScript data for both servers and desktops. Read on to see what the risks are. There are workarounds, so maybe you will want to enable PDF and PostScript processing by ImageMagick. But make sure you understand the risks before continuing. Ghostscript is a PostScript interpreter. Open-source PDF tools will rely on Ghostscript. This is where the danger lies. When you view a PostScript or PDF file downloaded from the Internet or received from a stranger, you are running a program from an untrusted source. Restricts file operations the job can perform. Strongly recommended for spoolers, conversion scripts or other sensitive environments where a badly written or malicious PostScript program code must be prevented from changing important files. The above sounds good, as far as it goes. However, attackers have found ways to bypass the -dSAFER flag. And, more recently, they have found alternative attack vectors that -dSAFER doesn't catch. There's a very good argument that this is a language specification flaw in PostScript. In other words, PostScript defines a language with unfixable security problems. Artifex Software, Inc., maintains the Ghostscript project. While they made patches available, they didn't release a new, patched version. These PostScript problems can open you to attacks in two very different circumstances. First, if you run a server that allows people to upload images for processing. Second, if you use a Linux desktop with the default settings found on many distributions. Imagine a server that allows users to upload images for processing. Conversion between JPEG and other formats, resizing, or maybe enhancing. That server probably uses ImageMagick as its back end. ImageMagick doesn't pay attention to file name extensions. It reads the beginning of the file to figure out what format it contains — JPEG, GIF, PNG, whatever. That means that an attacker could rename a hostile PostScript file whatever.jpg and upload it, bypassing any intended restrictions for "image data only". The server would give the new input data to ImageMagick, which would run the hostile PostScript program. That could include arbitrary shell commands run with the credentials of the web server process. If we instead are talking about your desktop, then you might want to enable those data types for ImageMagick. ImageMagick's default security policy imposes limits of 256 MiB memory, image dimensions of no more than 8196 pixels high or wide, files can be no larger than 1 GiB, individual tasks can take no more than 120 seconds, and others. See the ImageMagick security policy page for more details. I can increase those limits if I want. I was interested in generating a PDF file from a series of JPEG scans of pages. So, I didn't need to use "read|write" above. I could have allowed only "write" and still accomplished what I want. However, fixing this problem has shown us other PostScript-based security problems. Some are obvious, like components of LaTeX and print service. Other, though, are somewhat cryptic. There are some dangerous ones lurking in the list. Desktop environments like Gnome and KDE include file indexing and search tools. These automatically run in the background, reading all of your files with a variety of software packages, including the dangerous PostScript interpreters. If you're wondering why your desktop runs slowly, and why the disk activity light is so very busy, it's likely because of these indexing tools! 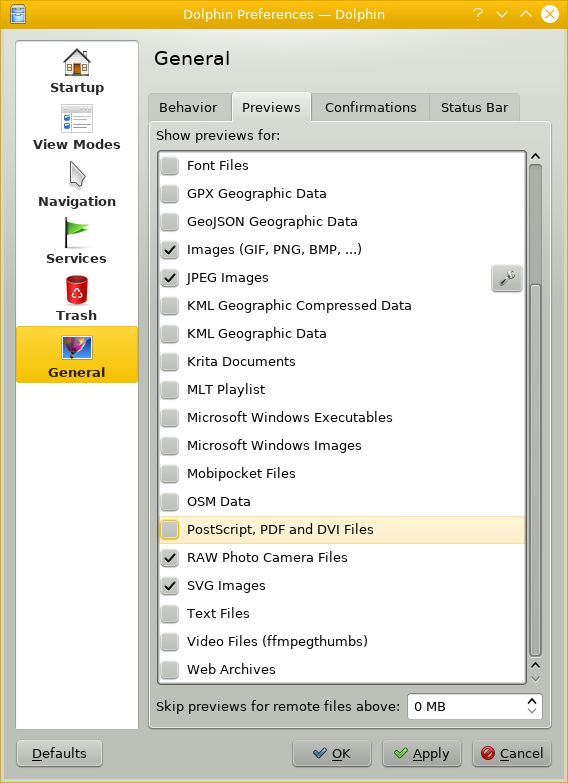 Also, a graphical file manager may use PostScript interpreters to create previews or "thumbnails". /usr/share/kde-settings/kde-profile/default/share/config/. And, we can't simply remove the packages due to dependencies. Your distribution might have put things in strange places. So, before continuing you might want to find where configuration files might have been hidden. Edit ~/.kde*/share/config/nepomukserverrc and change any start or autostart values from true to false. Edit ~/.kde*/share/config/baloofilerc or ~/.config/baloofilerc and change Indexing-Enabled to false. Edit ~/kde*/share/config/akonadiserverrc or ~/.config/akonadi/akonadiserverrc and change StartServer to false. Or, you can change it through its menus.